Going to a laundromat is stressful. Laundromats are often weird, creepy places. Before you get there, you don’t know if the machines will be full or broken. And if you forget something, you waste the most precious commodity of all - time. How might we improve the laundromat experience for people who regularly use laundromats out of necessity? Our challenge was to design and test a product or service that solves an information experience problem. We decided on the laundromat experience because it’s a necessary service that remains largely ignored and persistently unpleasant. Swift Spin is a stress-free laundromat experience. Our laundromat concept is a membership-driven service with a welcoming, comfortable interior design and the convenience of an attached cafe. Members have the ability to reserve machines ahead of time using our mobile app, and will have access to our all-in-one, technology-integrated machines that supply detergent, softener, and easy coin-free payment. Now you can do your laundry and reclaim your time. See what machines are in use and reserve ahead of time using our mobile app. Our system is PayPal compatible. Use technology-integrated laundry machines that supply detergent, softener, and easy coin-free payment. 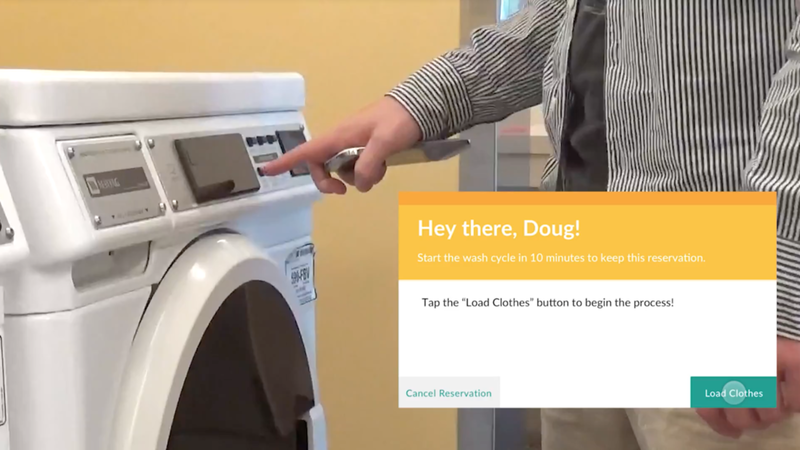 They wash and dry clothes without having to switch machines, and will send you a text message when your laundry is done. Wait or work in a welcoming, comfortable, WiFi-connected environment and enjoy the convenience of an attached cafe. We began our research by going to 4 different laundromats in Seattle and interviewing 8 people. What is the laundromat experience like? What do patrons need to know before, during, and after their trip to a laundromat? What opportunities exist to improve the laundromat experience? We mapped our research findings onto a table so that we could find commonalities and differences between the interviews. This revealed two types of customers who used laundromats out of necessity. I want to get my laundry done in the most efficient way possible. The lack of a better laundromat nearby has forced Doug to use his current laundromat out of necessity. He has come to dislike a lot of other people in the laundromat with him. It makes the space feel crowded. He really dislikes waiting when he could be doing something else. Lastly, Doug doesn’t care about bells and whistles. He just wants to get out of the laundromat as quick as possible. I want to make the most out of doing my laundry. Jessica is committed to her career as a photojournalist, but because of that, her hectic schedule doesn’t allow her to regularly do her laundry. She seeks out convenient laundromats that also offer amenities like free wifi and work desks. Sometimes though, she will feel up to socializing with the other people at the laundromat too. Good art and music helps set the mood, and a well decorated laundromat is always more enjoyable to be in. 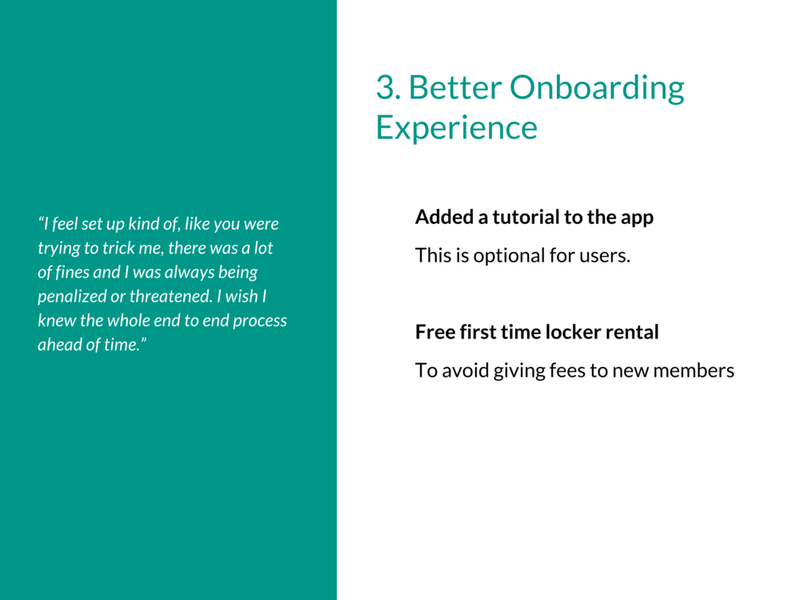 With our personas in mind, we generated 33 ideas for improving the laundromat experience. We used dot voting to narrow down to our top 10 ideas. We used storytelling to flesh out our top 10 ideas and ensure we had a deeper understanding of our primary persona. After reading the stories out loud, we then privately voted on our top five. This process made it clear that 2 of those ideas were particularly powerful. Items in red were removed from the service, while items in blue were added. The Lean Canvas was a quick way to solidify our idea and create a value proposition. After creating our lean canvas, we mapped out the customer journey map. Since the service is conceptual, we made a lot of assumptions about the journey and the customer’s emotional reaction throughout. The emotional journey based on our assumptions. My blueprint for the experience prototype. We created an experience prototype to test our assumptions about the customer journey. 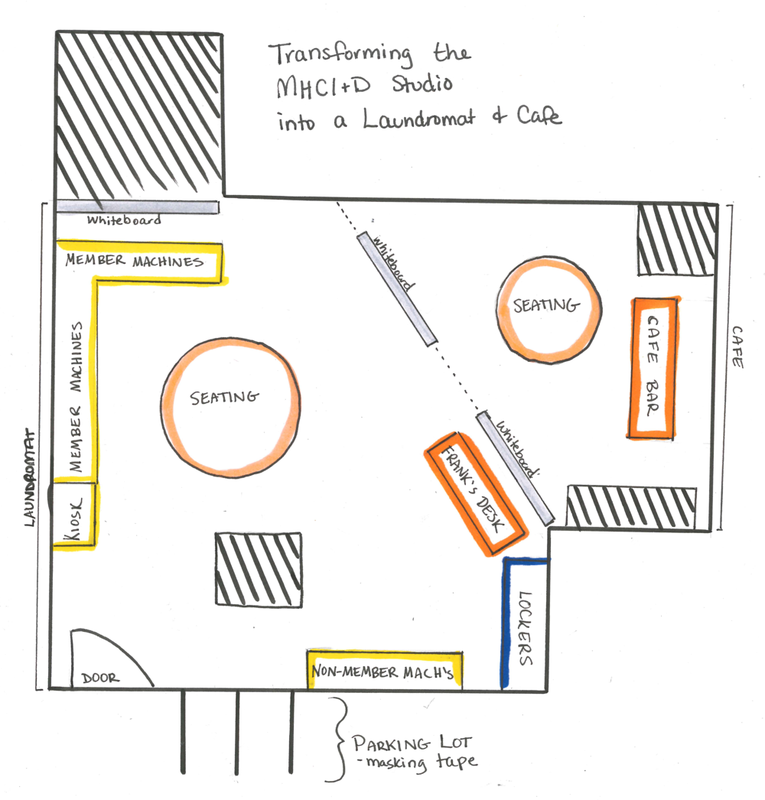 The MHCI+D studio was transformed into a low-fidelity laundromat and cafe by adding signage and rearranging the furniture. We also utilized additional spaces to stage parts of the journey outside the laundromat, such as unexpected traffic and the need to run errands. We also wanted to test the usability of the mobile app, machine, and kiosk interfaces. To do so, we created wireframes for each touchpoint. Below are wireflows of making and claiming machine reservations. Mobile Wireflow: reserving a machine using the app. Machine Wireflow: claiming a reservation on a laundry machine. Kiosk Wireflow: making a reservation using the kiosk. We tested our experience prototype with 3 participants: two of them closely matched our primary persona and one closely matched our secondary persona. How will people react if their reservation expires? What will they do next? How do people feel about the cafe? Will people use all of the channels we provide? How usable is the machine UI for new people? It’s problematic if people leave their clothes for too long. Is a late fee the best solution to this problem? Between each participant we identified high and low points which drove design iterations during our experience prototype. The first participant expressed ambivalence about the cafe, but loved the machine reservation ability. However, he was confused by the machine UI prototype because the welcome screen was too confusing, so we simplified the screen for the next participant. Participant two was thrilled with the laundry folding service, but the repeated notifications caused anxiety. He also stated he wished to have some prior knowledge of the whole system before coming to the laundromat. For participant three, we reduced the number of notifications & moved the walkthrough signage to the front of the laundromat. He loved the mobile app, but wanted customizability regarding notification frequency. He was also overwhelmed by the amount of information presented on the walkthrough poster. Our findings show that overall, the machine reservation system and the cafe were experiences well worth the investment. However, more work was needed to fix the pain points of the cancelled reservation and the late fee. We responded to our user feedback by clarifying the information experience, removing any unnecessary channels or information, and creating a better onboarding experience.